The Qian Men (front gate) at the southern end of Tian’an Men Square was once part of the inner city walls. These divided the imperial quarters of the Manchu emperors from the “Chinese city,” where the massed populace lived apart from their overlords. Walking south from the gate you are immediately plunged into a network of narrow and lively hutongs (alleys), the remnants of the old quarter. 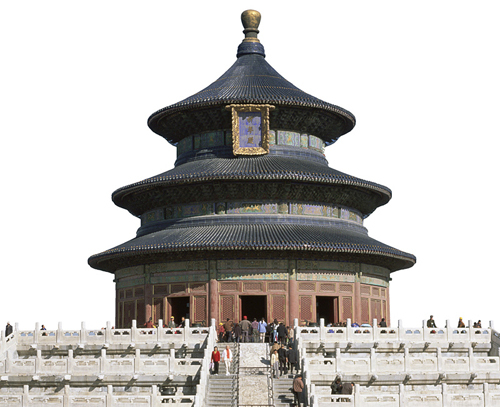 Continuing south down Qian Men Dajie eventually brings you to the western perimeter of the grounds of the Temple of Heaven, one of Beijing’s most evocative sights. The Boxers, a band of xenophobic rebels from north China who rose up to rid China of the “foreign devils,” drew from superstitious rituals that they believed made them invulnerable. Supported by the Empress Dowager Cixi, the rebels laid waste to Beijing’s Legation Quarter in 1900 while besieging the district’s foreign population. The siege was eventually broken by an eight-power allied force. On display here are dreams of the architecture and urban landscape of Beijing to be. These are dramatically represented through the medium of film, plus a vast model that covers most of the third floor and that is viewable from a gallery above. A historical royal street and traditional shopping area, quaint Qian Men Dajie has a 1920s-style tram line and birdcage-like streetlamps. Running west off the northern end of Qian Men is Dazhalan Jie, an old hutong area that is great for exploring on foot or by rickshaw. It is full of Qing-era specialty shops selling pickles, silks, tea, and traditional Chinese medicine. 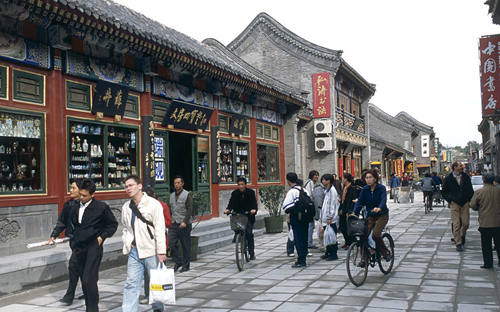 To the west of Dazhalan is Liulichang Jie, with many restored buildings and many fascinating antique shops. 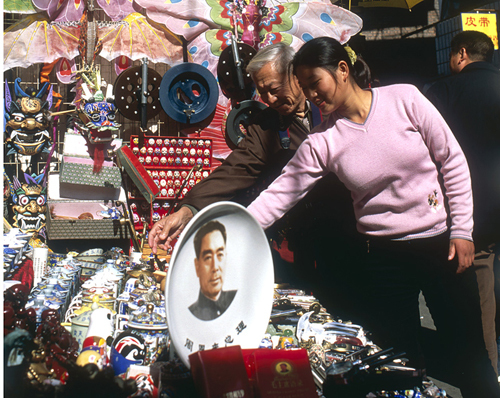 At the height of the Sino-Soviet rift in the 1960s, Mao Zedong gave orders to carve out a vast network of bombproof tunnels beneath Beijing. Part of this subterranean hideaway is open to the public. Guides show visitors around a circuit of dank tunnels, where signs illustrate the earlier functions of rooms, variously designated as hospitals, armories, and stores for food and water. Unlit passageways branch off from the main corridors, but many are blocked, and it is dangerous to wander off alone. At the end of the Second Opium War, in 1860, foreign delegations were permitted to take up residence in a quarter southeast of the Forbidden City. 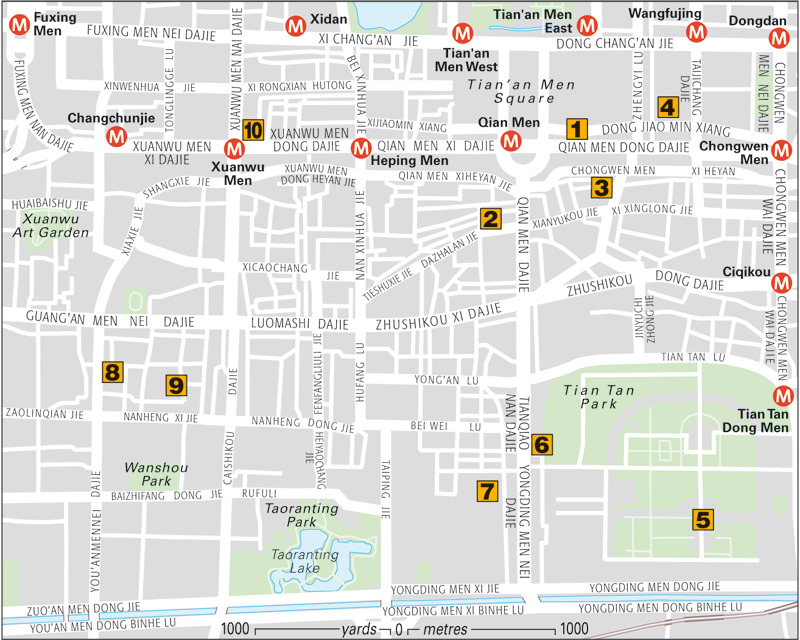 On main Dong Jiao Min Xiang and surrounding streets, the first modern foreign buildings in Beijing took root. The embassies have long since left, and new occupants have moved in.The former American legation, for instance, is now a restaurant, bar, and lifestyle complex. 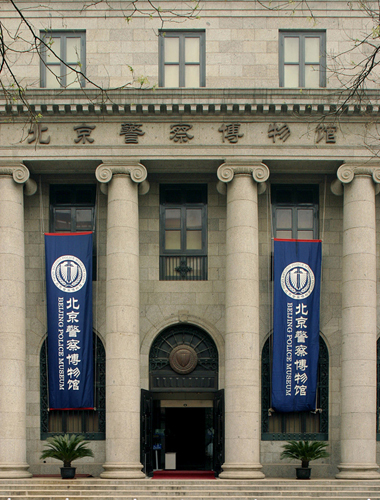 Also here are the former City Bank of New York, now the Beijing Police Museum, and St. Michael’s Church. 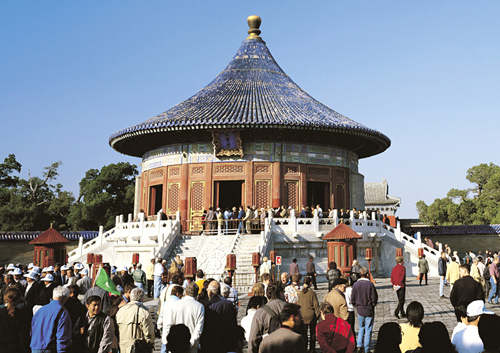 The name refers to a vast complex that encompasses a large, marble sacrificial altar, the iconic three-story Hall of Prayer for Good Harvests, the smaller Imperial Vault of Heaven, and many ancillary buildings, all set in a landscaped park. Allow at least a half day to take in everything . 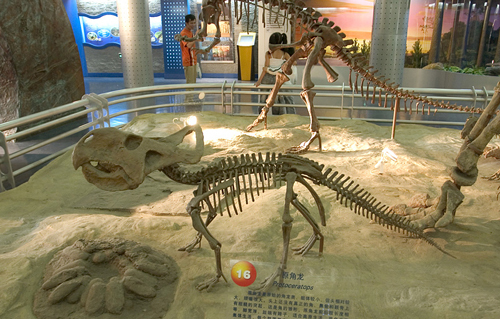 An overbearing piece of 1950s architecture houses a great collection of dinosaur skeletons, as well as stuffed pandas and other animals. There are also fish, both dead (preserved in formaldehyde) and alive (in the aquarium). Visitors of a nervous disposition may want to skip the partially dissected human cadavers, also pickled in formaldehyde, which are displayed up on the third floor. Housed in the Hall of Jupiter, part of the Xiannong Tan temple complex, this museum offers an excellent introduction to the ancient construction techniques of Beijing buildings, all helpfully illuminated with detailed models. A fascinating three-dimensional plan shows the city as it was in 1949, its city walls and gates largely intact. 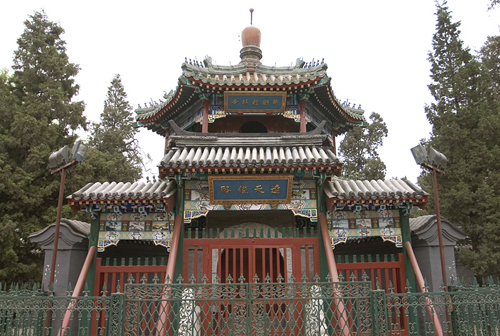 Beijing’s oldest and largest mosque dates back to the 10th century. It’s an attractive building with Islamic motifs and Arabic verses decorating its halls and assorted stelae. Astronomical observations were made from the tower-like Wangyue Lou. The courtyard is lush with greenery, making it an idyllic escape from the city streets. Visitors should dress conservatively, and non-Muslims are not allowed to enter the prayer hall. This temple dates back to AD 696 and is probably the oldest temple in Beijing. All this time later, it remains a hive of activity. The layout is typical of Buddhist temples. Near the gate, the incense burner is flanked by the Drum and Bell Towers to the east and west. Beyond, the Hall of the Heavenly Kings is guarded by a pair of bronze lions. The Scripture Hall at the temple’s rear stores sutras, while another hall contains a 16-ft (5-m) statue of Buddha. The first Catholic church to be built in Beijing stands on the site of the residence of the first Jesuit missionary to reach the city, Matteo Ricci. Arriving in 1601, the Italian won the favor of the Wanli emperor by presenting him with gifts of European curiosities such as clocks and mathematical instruments. 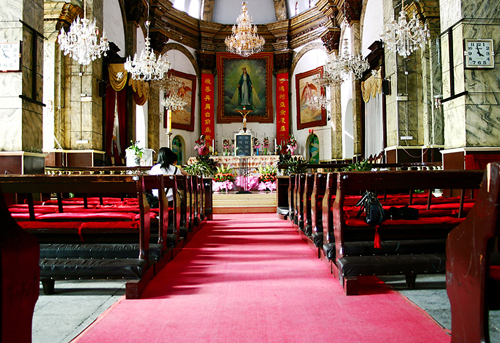 Ricci founded the church in 1605, although the present building dates to 1904, replacing a structure that was burned down during the Boxer Rebellion. It boasts some fine stained-glass windows.